This book is a continuation of Giorgio Agamben's investigation of political theory, which began with the highly influential volume Homo Sacer: Sovereign Power and Bare Life. Having already traced the roots of the idea of sovereignty, sacredness, and economy, he now turns to a perhaps unlikely topic: the concept of the oath. 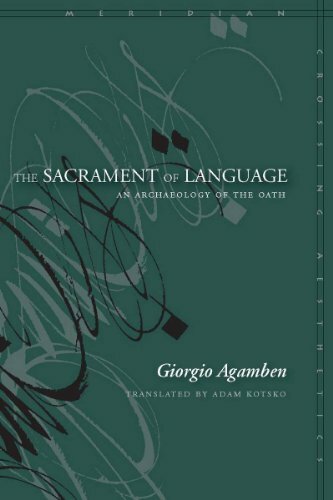 Following the Italian scholar Paolo Prodi, Agamben sees the oath as foundational for Western politics and undertakes an exploration of the roots of the phenomenon of the oath in human experience. He rejects the common idea that the oath finds its origin in religion, arguing instead that the oath points toward a particular response to the experience of language, a response that gave birth to both religion and law as we now know them. This book is important not only for readers of Agamben or of continental philosophy more broadly, but for anyone interested in questions relating to the relationships among religion, law, and language. If you have any questions about this product by Brand: Stanford University Press, contact us by completing and submitting the form below. If you are looking for a specif part number, please include it with your message.